You live a life, or perhaps you’ve lived half your life, according to the mortality statistics. To understand the second half, you must first understand the first. To do that, you turn to a variety of tools: memory, questioning, affection and gratitude, love and faith, consideration of jobs held and work done, playfulness and keen, honest, detailed observation. 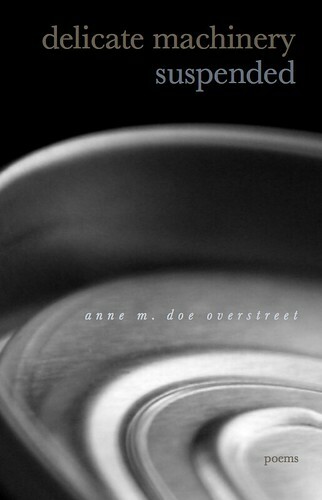 If you’re poet Anne Overstreet, you do these things and you create Delicate Machinery Suspended: Poems, poetry about a life observed, but also about the life to come. And it is a beautiful collection indeed. only on the day of the dead; there is no other color like theirs. My eye thinks chromium yellow. But, perhaps not. the life gone out of them as it always does. The scene shifts, but the reality, in all of its intricate detail, remains startlingly similar. The empty house with its remnants of a life lived, and the “trickle they call a river around here” both suggest much about our mortality. Overstreet observes with the camera’s eye, capturing detail and nuance like filmmaking close-ups, a technique she uses in poems like “If It Doesn’t Rain Soon” as well, where her eye shifts from a man walking along a street to traffic passing a lounge and a video store, a woman sitting in a lawn chair, a snapshot of activity at a fire station, and a neighbor sitting at a kitchen table, and through each scene the suggestion of heat, humidity and needed rain. It’s an arresting approach, this camera eye moving quickly, capturing the sense of what this moment is like, assimilating and understanding. having done enough and more. for water in the walls, for mice. for as long as its roots hold. to hold, for now, together. This is a home in an old building, of course, but it is also more –it is a life, a family and relationships, holding together by agreement and observation. Here, as in many of Overstreet’s poems, one also finds a subtle affection and even gratitude for the people who have helped create this life the poet knows. The poems can be simultaneously playful and serious, as when they do a slight retelling of the “Little Red Riding Hood” fairy tale, in “Sleeping in Grandmother Wolfe’s House” and “Red #9.” You smile as you read them, and then the smile gives way to serious consideration. Overstreet is not simply retelling a fairy tale; she is considering what fairy tales mean in dream-like renderings. This same playful-yet-serious sense of life is seen in one of the most beautiful poems of the collection, “Soufflé, ” which begins as a description of the preparation of a soufflé but becomes an incredible love poem. This collection, Overstreet’s first, displays a command of language, style and content that is deeply affecting. You are watching a series of scenes filmed with the eye of an artist. And what she paints in Delicate Machinery Suspended of her life observed is a beautiful and wondrous thing. Still waiting for my copy to arrive. I’ve been looking forward to reading Anne’s collection. I like what you say about the tension of the poems: serious and playful at the same time. Not easy to achieve. And something I absolutely love in poetry.